12th Ward City Council candidates José Rico and Pete Demay, right, speak at the candidate forum on Thursday, February 7, 2019, at St. Maurice Church hall. 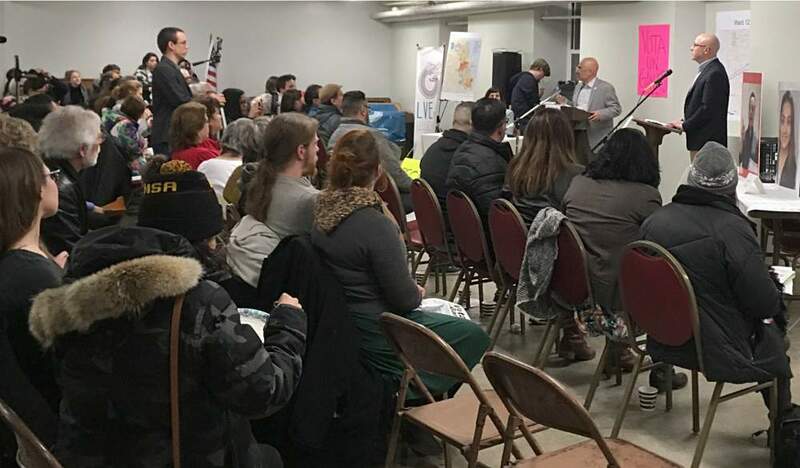 Aldermanic candidates Pete DeMay and José Rico shared their visions for the 12th Ward with a capacity crowd at the candidate forum on Thursday, February 7, 2019, at St. Maurice Church hall. Co-sponsored by the McKinley Park neighborhood-based Neighbors for Environmental Justice, the forum attracted nearly 200 attendees. For 90 minutes, DeMay and Rico spoke and answered questions from the audience, addressing a number of local issues such as affordable housing, environmental issues, soil testing at public parks and improving local schools. "It was wonderful to see candidates for elected office taking issues of environmental justice and the health impacts of pollution on our 12th ward community seriously," said Neighbors for Environmental Justice President Robert Beedle. 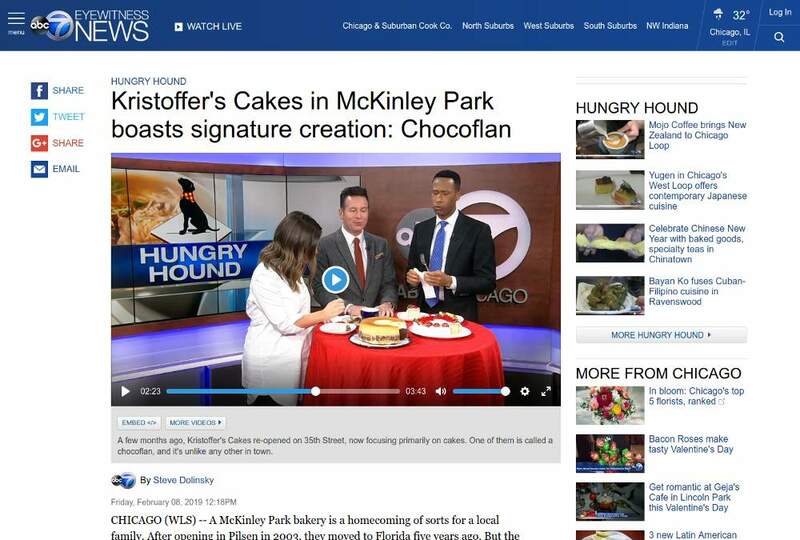 The ABC7 News website features Steve Dolinsky's writeup and video reports on Kristoffer's Cakes in the McKinley Park neighborhood. Kristoffer's Cakes, the new sweets shop at 1735 W. 35th St., continues to wow foodies across the Chicago area with signature tres leches cakes and other treats. The latest media luminary to make the pilgrimage is Steve Dolinsky, also known as the "Hungry Hound" for ABC7 WLS-TV, who recently featured Kristoffer's in a writeup and broadcast video report. Dolinsky focused on Kristoffer's signature chocoflan cake and also highlighted the history of the business. In addition to the leading video segment and live report, an "extra course" video delves deeper into Kristoffer's array of baked goods. As reported by the Chicago Sun-Times newspaper, the Chicago Police Department has issued an alert regarding multiple thefts of large construction equipment from McKinley Park neighborhood work sites. Five incidents of construction equipment theft have plagued the neighborhood, starting with a December 7, 2018, heist in the 3200 block of South Ashland Avenue. Additional thefts occurred around 7 a.m. on January 9, 2019, in the 1700 block of West 35th Street; around 4 p.m. on January 9 in the 1600 block of West 35th Street; around 6:30 a.m. on January 14 in the 3500 block of South Marshfield Avenue; and around noon on February 2 in the 1900 block of West Pershing Road. 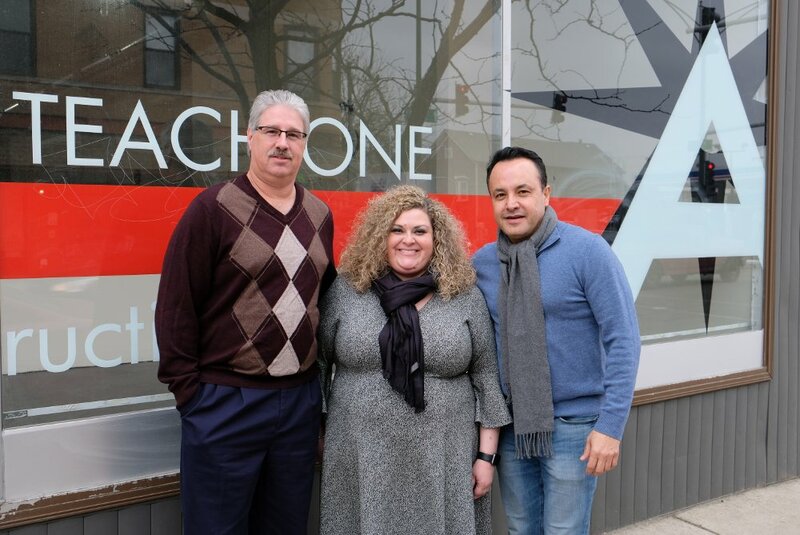 Topnotch Silkscreen owner Anthony Slezak, Aquinas Literacy Center Executive Director Alison Altmeyer and 12th Ward Alderman George Cardenas gather in front of Aquinas' storefront facade, which is slated for an overhaul with its Small Business Improvement Fund grant. Three neighborhood enterprises have successfully landed grants from the Small Business Improvement Fund of Chicago's Archer and Western Tax Increment Financing (TIF) District to help improve their properties in 2019. The building for the Aquinas Literacy Center at 1751 W. 35th St., the prospective restaurant space at 1734 W. 35th St. and the Topnotch Silkscreening building at 3382 S. Archer Ave. all were approved by Chicago's Department of Planning and Development for significant funding of their property improvement costs. Aquinas and property owner Kenneth Ricci stand to get 50 percent of the costs funded toward improving the building's frontage. "Our goal is to improve the facade so it is whole and it energizes the community," said Aquinas Executive Director Alison Altmeyer. In addition to swapping existing siding for brick veneer, the street-facing Aquinas facade will get new storefront elements, including a new door, aluminum framing and double-insulated glass windows. If you're under the gun for Valentine's Day plans, there's no hotter neighborhood ticket than the 21-and-over Latin Nights with Sandra Magaña this Thursday, February 14, at One City Tap. The evening starts with a lesson in the merengue style of dance and continues with an open dance floor accompanied by the Tap's tasty libations. The lesson costs $8 for each dancer, and Magaña is teaching different styles of dance through February, including bachata and salsa. Teens and families can find their Valentine's Day fun on Saturday, February 16, at the Valentine's Day Dance at Our Lady of Good Counsel Church. A DJ will pump out the jams alongside a heap of Mexican delicacies for sale. Tickets cost $10 each, with young people 14 years old and younger entering for free. All proceeds from this event will go toward helping a local parishoner familiy that recently lost its home in a fire.